Mercenary Geologist Mickey Fulp tackled the uranium market at last week’s Mines and Money conference in New York. Mercenary Geologist Mickey Fulp tackled the uranium space in a presentation at last week’s Mines and Money conference in New York, speaking to investors about a market that’s been plagued for years by oversupply and low prices. In an interview at the sidelines of the show, he spoke further about what the future may bring for uranium. “I think we’re going to see some more supply disruption if not destruction going forward,” Fulp said, adding that he also sees demand increasing. “Demand is coming, it’s going to increase going forward. But we’ve still got a supply/demand imbalance — we’ve got too much supply still on the market,” he commented. Watch the interview above for more of Fulp’s thoughts on uranium. He also discusses the gold market and shares updates on three companies he’s covering: Allegiant Gold (TSXV:AUAU), Ely Gold Royalties (TSXV:ELY) and Eagle Plains Resources (TSXV:EPL). The transcript for this interview is available below. INN: We’re here at Mines and Money in New York, and tomorrow you’ll be giving a talk on the uranium space. We’ve had a number of major producers cut supply recently with little reaction from prices. Do you think more supply cuts are in the cards? MF: I think so, because [we’re] at a $21 spot price, [with] an increasingly large [share of] the market being sold on the spot market vs. long-term contracts. Yes, I think we’re going to see some more supply disruption if not destruction going forward. INN: What about demand? It seems like the consensus is that uranium demand is only going to rise moving forward. Where is this demand going to come from and when might it emerge? MF: It’s emerging every year. We’re looking at 3- to 4-percent overall growth of uranium demand, I don’t see that ending. There’s 57 reactors being constructed right now, and another 160 or thereabouts that are planned, which means they’ve got initial financing and permitting. So that demand’s going to increase, it’s the only source of baseload electricity that we have left that’s not generating a large carbon footprint. Demand is coming, it’s going to increase going forward. But we’ve still got a supply/demand imbalance — we’ve got too much supply still on the market. A lot of that has to do with the fact that we still have something on the order of 45 Japanese reactors offline compared to the number they had pre-Fukushima. 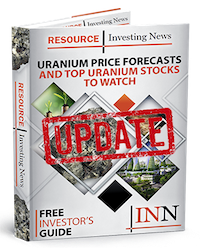 INN: Investors have been hearing for a long time that uranium prices are set to rebound, and in your talk you’ll be talking about whether investors should be cautiously optimistic or concerned. Which way are you leaning right now? MF: The question is “when,” and I can’t answer that question. I don’t think anybody can. The uranium market is extremely opaque. It’s not only about mine supply, but secondary supplies have been increasingly important. A lot of those have maxed out or will be in decline. So when? I don’t know. I know it will happen, [and] I know when it happens based on previous experience that the uranium price will increase very quickly whenever it happens. The $64,000 question is “when?” and I’m not going to try to answer that because I don’t know. I mean, insiders in the business don’t know. INN: We’ll leave uranium for now, take a step back from that and focus on gold, which I believe you are feeling a little bit more positive about. What is gold looking like so far for you this year? MF: Gold has become increasingly rangebound between $1,300 and $1,360. And it actually, if you look at charts over the last year or so … seldom gets below or above those two channels. It tried to test $1,300 again last week and went to $1,302 and bounced back. I think it’s $1,314 as we speak today. Three weeks before that, it tried to go past $1,360. It briefly did that intraday, but it finished at $1,357. So it’s increasingly rangebound, and a lot of it is correlated, negatively correlated, with the US dollar. Over the last month or so, the US dollar has increased 3 percent, and gold is down from $1,350 to $1,315. Doing the math in my head that’s pretty much 3 percent. So as long as the dollar is strong, I don’t look for a breakout in gold in the near future. INN: So that would be the catalyst we would need to see to have a higher gold price? MF: Well, it’s one of the catalysts. We can also have a weaker US economy, geopolitical risk in one or the other parts of the world. This Iran deal, it’s going to come down here at the end of the week, if not today … and we expect Trump to scuttle the Iran nuclear deal — for good reason. It’s a bad deal for the US. If that happens, that’s going to introduce some geopolitical risk, I would expect gold to go up. We’ve seen oil prices surge on that thought over the last two or three days. Oil is above — WTI’s above $70 right now. We’ve got the pending meeting between “little rocket man” and “the old dotard.” Now they’re actually going to sit down and talk. I don’t think that venue has been announced, but if there is progress made with North Korea and the US in terms of getting rid of nuclear programs in North Korea, that’s going to be negative for gold because it’s going to reduce some geopolitical risk. Those are some of the factors. We also should not neglect to mention that we’re coming into the low season for gold in about a month, mid-June. I’d say five weeks, six weeks is the seasonal low for gold demand, and we normally see a seasonal, if not a year low, during that period of time. So going forward I don’t see a lot of catalysts on the immediate horizon [that are] going to move gold above that magical number of $1,360. If it gets there, when it gets there — and I’m convinced it will — when it gets there and sticks there, then the next big resistance is $1,400. If we get past $1,400, that’s going to be very good for a bunch of gold stocks. INN: So we need to exercise a little patience for now. Just in closing, why don’t you give me an update on some of the gold stocks you are looking at right now. MF: I can tell you the ones I cover. I cover Allegiant Gold, they are a spinout of Columbus Gold (TSX:CGT). They are drilling round the clock at Eastside, we expect drill results imminently on that and a new resource estimate at Eastside, which we expect to increase significantly. I cover Ely Gold Royalties with 70 prospects and a significant number of those vended to joint-venture partners and/or have royalties, non-producing royalties, but some with advance smelter returns, in Nevada. I will be visiting that company in about six weeks. We picked it at 9 cents, it’s been as high as 14; it’s settled back down into the 11-cent range. So for people that didn’t get in when we first picked that stock, it might be an opportunity now. I cover Eagle Plains Resources, they have just spun out Taiga Gold (CSE:TGC). We got our 50-percent dividend on that. SSR Mining (TSX:SSRM,NASDAQ:SSRM) is drilling with two or three rigs, not sure of the exact number of rigs, in Saskatchewan as we speak, and once again we’re hopeful for very good gold results from that program. Editorial Disclosure: Ely Gold Royalties is a client of the Investing News Network. This article is not paid-for content.